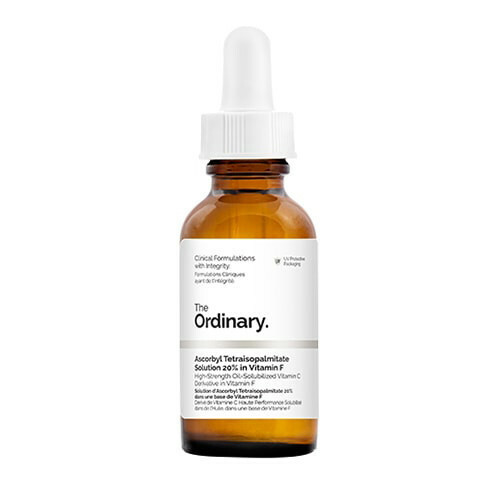 A vitamin-rich serum that visibly targets dullness, uneven tone, and signs of ageing. Using a potent blend of fatty acids and one of the most stable forms of Vitamin C, this silky oil solution delivers all of the benefits of Vitamin C (boosted collagen production and antioxidant protection) alongside specific brightening benefits. What&apos;s more, the two ingredients work in synthesis to improve the performance of the other, meaning results are quickly visible. Ascorbyl Tetraisopalmitate - A non-exfoliating, oil-soluble derivative of Vitamin C, meaning it can be used in high-concentrations without irritating skin. Vitamin F - Essential fatty acids with anti-inflammatory benefits that helps to improve ingredient penetration.